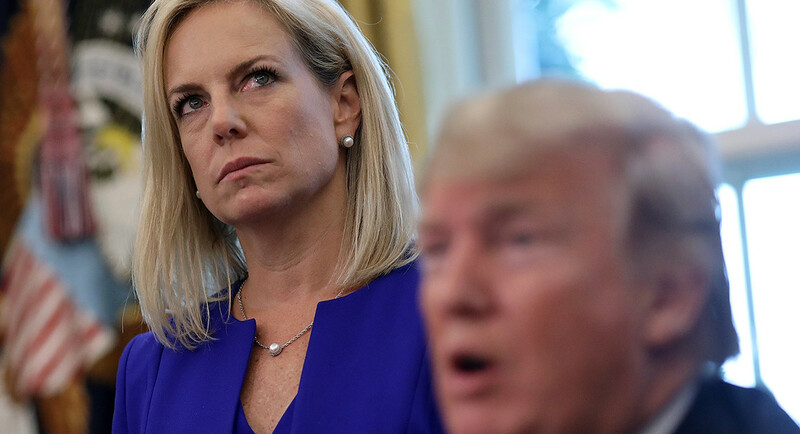 Breaking News: Department of Homeland Security Kirstjen Nielsen is resigning. She was the architect of the administration's family separation policy. Today's letter, written before this news broke, focuses on our nation's immigration policies. Kirstjen Nielsen is leaving the Department of Homeland Security. “Now, I might expect someone to describe another human being as ‘an infestation’ in the Third Reich. I would not expect it in the United States of America,” the former congressman from Texas added, drawing an enthusiastic response from a crowd of about 150 people, including dozens of young people. Donald Trump has, since the start of his campaign, demonized and dehumanized immigrants. If things are going bad for him – which they often are – he turns to what he knows and does best; demonizing immigrants. Not surprisingly, hate crimes against immigrants have consistently risen since his campaign started, as has the activity of white nationalist groups. There is a direct correlation between the use of hate speech and the resulting violence against those objectified by hate speech. And there is nothing new about this connection as our passage in Scripture shows us. Trump, Stephen Miller and the members of his administration are simply followers of the likes of Haman and King Ahasuerus in the book of Esther. At the time of this verse in the story of Esther, Haman had been lifted to the number two position in the Kingdom and was offended that Mordecai, Esther’s uncle, had not bowed down in homage. So insecure is he in his power – like trump is in his position – that he lashes out against the Jews and manipulate the King to issue an edict that calls for the genocide of the Jewish people. Briefly here is how he did it. He begins his argument with a statement of relative truth. “There is a certain people scattered and separated among the peoples in all the provinces of your kingdom.” (3:8) Haman cannot begin with the blunt request to annihilate the Jews. He smartly begins where his listener is and with a statement that anyone would agree with so he can earn the king’s trust before he moves on to his more diabolical intentions. Haman then swerves from truthfulness as he says, “and they do not keep the king’s laws.” (3:8) This is an entirely meritless statement. Haman ignores the earlier part of the story in this book where Mordecai discovers a conspiracy against the King and thus, by reporting it, saves the King’s life. Haman’s statement here is little more than a thinly veiled anti-Semitic trope of the “otherness” of the Jewish people. Dehumanization depends on “othering” those who are hated and feared. Dehumanization is based on lies and entirely ignores the contributions of the people who are being denigrated. As we have all seen these last few years, trump follows Haman’s playbook to a tee. Haman ends his conversation urging the King to not “tolerate them.” Haman knows that committing evil against a people is much easier when the people who are being targeted remain faceless and nameless. The more personal they are the more difficult it is to order their extinction. Haman must dehumanize the Jews and create an image of the Jews as an enemy; as inhuman. In other words, he must lie. This is exactly what Trump does as well. He calls all immigrants gang members. He calls for “America First,” with a thinly veiled understanding that he really means “White American First.” He calls them animals and he treats immigrants like animals as well, caging them, denying them their due process rights, and blaming them for every ill people face. Trump lies, in other words. Throughout history when a dominant group wishes to exploit, colonize, or oppress another group, they begin the evil with denigration and dehumanization. This is why the work of resistance is such holy work. Peoples’ lives are literally dependent on it. As Trump and Miller and his administration dehumanize through detachment and generalizing the lives of immigrants, the resistance demands that we must personalize and lift up the stories of those seeking refuge. Therefore, we must be in relationship with those who sojourn to the United States. eyes lifted looking for the Christ light in us. another world is necessary and possible. Let it begin with us.